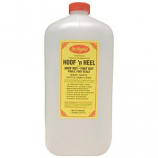 Penetrates deep into the hoof to attack hoof rot foot rot fouls foot scald and to rapidly cure lameness.. Wont cause discoloration hardening shrinkage or brittling of the hoof.. Wont stain wool or hair and leaves no residue behind. Treats thrush in horses. Useful against white line disease.